One of two native spurges found exclusively on sand dunes, the other being Portland spurge (Euphorbia portlandica) which is much commoner. 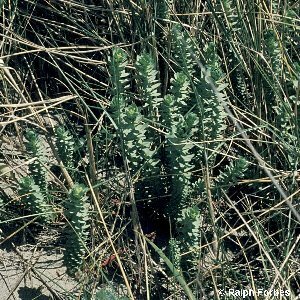 A fairly fleshy plant of the more open areas of sand dunes. It is only found on a few dune systems in Co.s Down and Antrim. All names: Euphorbia paralias L.